When I was in Madrid for a conference a good number of years ago, I spent an afternoon at the Museo Nacional del Prado. It was an amazing feast for the eyes: more sumptuous than expected and completely satisfying. One of the most interesting works I admired that day was Hieronymous Bosch's The Garden of Earthly Delights. I lost track of time as my eyes lost themselves in the intricate details of Bosch's vision. I still have a few postcards from that visit and I scanned my favorite one to introduce this post. As you may have guessed, our virtual tour of the European Community has arrived in Spain. As a result of a complicated train of thought that had as main ingredient my knowledge of Spanish history, I decided to look for a Jewish dish. I soon found a source of information in the book "A Drizzle of Honey The Life and Recipes of Spain's Secret Jews" by David M. Gitlitz and Linda Kay Davidson. When Iberian Jews were converted to Catholicism under duress during the Inquisition, many struggled to retain their Jewish identity in private while projecting Christian conformity in the public sphere. The recipes "combine Christian & Islamic traditions in cooking lamb, beef, fish, eggplant, chickpeas, and greens and use seasonings such as saffron, mace, ginger, and cinnamon" (zafferano, macis, zenzero e cannella). Originally, these egg dishes were prepared on top of the stove: thus the term fritada, fried. Later... the dishes were baked, and in many places the term for these dishes changed to cujada (coagulated). The very last line of the recipe states that any vegetable can be substituted for the eggplant, so I immediately decided I would use some lovely cauliflower (cavolfiore) from Redwood Roots Farm. The preparation of the eggplant described in the recipe does not apply to cauliflower. I decided to roast the florets, which would keep them crisp. I then adjusted the quantity of the spices to my taste. Finally, I used some of my homemade Quark cheese: not quite Spanish but quite tasty. The result was a lovely light dish, where the crisp cauliflower is suspended in a light egg matrix. For the next rendition, I adjusted the recipe to use a vegetable of a consistency closer to that of mashed eggplant. In my crisper, I had a small zoo of vegetables: broccoli florets, a tiny cauliflower head, two carrots (carote), red beet greens and their stems and chard stems. I decided to steam all of the vegetables together. I sometimes do wild things because I like to get wild results. This one was wildly good — though less photogenic than its predecessor. The texture was soft throughout, reminiscent of souffle. The flavor of the various vegetables blended in a perfectly pitched choir (coro). I liked both versions of the recipe so I am presenting both. 2 lbs mixed vegetables from your crisper (for example: broccoli, cauliflower, carrots, chard stems). Note 1: the original recipe calls for 1/2 teaspoon of ground black pepper and 3/4 teaspoon of ground cinnamon. I toned down both spices in my rendition. I used saffron in the cauliflower version but not in the mixed vegetable version: consider using it or not, depending on your choice of vegetable(s). Note 2: The original recipe calls for 1 cup cubed semisoft cheese, cut into 1/2-1 inch cubes, so if you don't have Quark cheese, you can substitute a semisoft cheese of your liking. However, I recommend cutting it into smaller cubes, so you can distribute it better. Break eggs and place yolks and whites in separate bowls. Choose a large bowl for the yolks, since that's where you will end up with all the ingredients. Cut cauliflower into small florets. Peel stalk and cut into coins. Keep small leaves. Place in a large baking pan. Spray cauliflower with olive oil using a mister and stir well. Bake for 15 minutes, then stir. Bake for another 15 minutes or so. The florets should not brown. Take out of the oven and let cool. Trim all the vegetables, cut into pieces according to their nature (e.g., broccoli and cauliflowers in florets, carrots in coins, chard stems into pieces, etc.) and steam until tender. Let cool, then puree (using a food processor or immersion blender), possibly leaving some of the vegetables in small chunks rather than smooth, to give a bit of varied texture to the casserole. As baking vessel I used a 9-inch / 23-cm round springform pan. You can oil the bottom or line it with parchment paper. Oil the sides as well. Beat yolks until creamy. Add saffron, if using and stir. Place the (empty) pan in the oven. Mix the spices and add them to the yolks, then add Quark cheese and blend. Finally, add the cauliflower and chopped parsley OR the mixed vegetable and stir well. Add about 1/3 of the egg whites and fold in using a spatula and a delicate hand. Add the rest of the egg whites and again fold in. Take the prepared springform pan out of the oven, transfer the egg and cauliflower OR mixed vegetable mixure into it, then place it in the oven. Bake for 30-35 minutes or until the casserole is set and its surface is golden. Note that the concept of "golden" may need to be adjusted, depending on the type of vegetables that you use. It applied as is to cauliflower, but when it came to the beet-colored vegetable mix, it was a more suble effect. The important thing is that the casserole is set. You can use a toothpick to check for that: it should come out clean when inserted at the center of the casserole. Take the casserole out of the oven. Let sit for a few minutes, then run a thin spatula around the edge and remove the ring. Serve sliced at the preferred temperature: "This casserole is good hot or cold, but the flavors are best if it is served at room temperature." 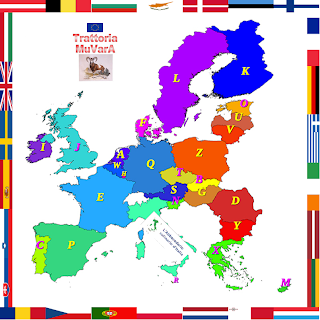 My casserole participates to the 16th installment of the Abbecedario culinario della Comunità Europea (European Community Culinary ABC), an event organized by Trattoria MuVarA that will bring us to visit 26 countries of the EU (all except Italy) using the alphabet as guide. P like Paella (Spain) is hosted by Francesca of Burro e zucchero. On this page you will find the recipe for Paella and the list of recipes contributed to the event. This is also my contribution to edition #414 of Weekend Herb Blogging, an event started by Kalyn of Kalyn's Kitchen, now organized by Haalo of Cook (almost) Anything at Least Once and hosted this week by Haalo herself. or launch the casseruola di uova e formaggio con verdure audio file [mp3]. Quando sono stata a Madrid per un congresso un certo numero di anni fa ho passato un pomeriggio al Museo Nacional del Prado. Per i miei occhi fu un banchetto piu lussoso di quanto mi aspettassi. Una delle opere più interesanti che ammirai quel giorno è Il giardino delle delizie di Hieronymous Bosch. Persi la cognizione del tempo mentre i miei occhi si persero nei dettagli intricati della visione di Bosch. Conservo delle cartoline acquistate durante quella visita e la mia preferita è quella qui in alto. Le ricetta "combinano la tradizione cristiane e quella islamica nella preparazione di agnello, manzo, pesce, melanzane, ceci e verdure e utilizzano spezie come zafferano, macis, zenzero e cannella." Originariamente, questi piatti a base di uova venivano cotti sul fuoco, da cui il termine fritada, fritto. Poi... i piatti vennero cotti nel forno e in molti luoghi il termine che li indica divenne cujada (coagulato). L'ultima riga della ricetta dice che le melanzane possono essere sostituite con qualunque altra verdura e io ho deciso di usare del cavolfiore appena raccolto. La preparazione delle melanzane non è adatta al cavolfiore. Ho scelto di cuocere in forno le cimette e mantenerle piuttosto croccanti. Ho poi adattato le quantità delle spezie al mio gusto. Infine, ho usato del formaggio Quark fatto in casa: non proprio spagnolo ma alquanto gustoso. Il risultato è stato un piatto molto gradevole e gradito, col cavolfiore croccantino immerso in una matrice all'uovo leggera. Quando ho rifatto la ricetta ho deciso di usare una verdura più vicina come consistenza alla melanzana. Nel frigorifero avevo uno zoo di verdure: cime di broccoli, un piccolo cavolfiore, due carote, steli delle foglie di barbabietola rossa e coste. Le ho cotte al vapore tutte insieme. Alle volte faccio cose un po' folli perché mi piace ottenere risultati folli e questo era follemente buono — anche se meno fotogenico del predecessore. La cosistenza soffice mi ha ricordato un soufflé. Il sapore delle varie verdure era in armonia come un coro ben affiatato. Mi sono piaciute entrambe le versioni della ricetta e quindi le presento entrambe. 900 g di verdure miste (per esempio broccoli, cavolfiore, carote, coste). Nota 1: la ricetta originale prevede 1/2 cucchiaino di pepe nero macinato e 3/4 cucchiaino di cannella in polvere. Io ho usato una quantità inferiore nella mia versione. Ho usato lo zafferano nella versione col cavolfiore ma non in quella con il misto di verdure. Voi decidete in base al vostro gusto e alla verdura che scegliete di usare. Nota 2: la ricetta originale prevede una tazza (240 ml) di formaggio semimorbido tagliato a dadi di 1,2-2,5 cm di lato, quindi se non avete il Quark potete sostituirlo col formaggio semimorbodo che preferite. Ma io lo taglerei a dadini più piccoli in modo tale che si distribuisca meglio. Rompere le uova e separare tuorli e albumi in due ciotole. Scegliete una ciotola capiente per i tuorli dal momento che in essa verranno poi mescolati tutti gli ingredienti. Riscaldare il forno a 190 C.
Mondare il cavolfiore e tagliarlo a cimette. Pelare e tagliare il gambo a rondelle. Usare anche le foglie più tenere. Metter il tutto in una teglia. Spruzzare il cavolfiore con olio d'oliva e mescolare bene. Cuocere in forno per 15 minuti, poi mescolare. Cuocere per altri 15 minuti circa. Le cime non devono diventare marroni scure. Sfornare e far intiepidire. Mondare tutte le verdure, tagliarle a pezzi a seconda della loro natura (per esempio, broccolo e cavolfiore a cimette, carote a rondelle, coste a pezzetti, ecc.) e cuocere al vapore fino a quando siano tenere. Far intiepidire e passarle (col robot o con un frullatore ad immersione) magari lasciando un po' delle verdure a pezzetti piuttosto che ottenere un purè omogeneo in modo da creare un po' di varietà nella consistenza. Per cuocere la casseruola io ho usato una teglia rotonda col bordo rimuovibile di 23 com di diametro. Ungere il fondo o coprirlo con carta da forno. Ungere i lati. Montare gli albumi a neve ferma. Mettere da parte. Sbattere i tuorli fino a quando siano cremosi. Aggiungere lo zafferano, se utilizzato, e mescolare. Mettere la teglia (vuota) nel forno. Mescolare le spezie e aggiungerle ai tuorli, poi aggiungere il Quark e incorporare. Infine, aggiungere il cavolfiore oppure le verdure e mescolare bene. Aggiungere 1/3 circa degli albumi e incorporare con movimento dal basso verso l'alto usando una spatola e una mano leggera. Aggiungere il resto degli albumi e incorporare come sopra. Tirare fuori dal forno la teglia, trasferire in esso il composto di uova e cavolfiore oppure verdure miste e infornare. Cuocere per 30-35 minuti o fino a quando la casseruola sia asciutta dentro e dorata in superficie. Il concetto di "dorata" deve essere adattato al tipo di verdure utilizzate. Si applica perfettamente al cavolfiore, ma quandoho preparato la versione rosso barbabietola, la doratura era più tenue. È importante che la casseruola sia cotta dentro e per controllare questo potete utilizzare uno stecchino: quando lo inserite al centro della casseruola deve uscire pulito. Sfornare la casseruola. Farla riposare per alcuni minuti e poi far scorrere una spatolina lungo il bordo per staccare l'anello della teglia. Servire a fette alla temperatura preferita: "Questa casseruola è buona sia calda che fredda, ma il sapore è migliore se viene servita a temperatura ambiente." Con la mia casseruola partecipo alla sedicesima tappa dell'Abbecedario culinario della Comunità Europea, un evento organizzato dalla Trattoria MuVarA che ci porterà a visitare i 26 paesi della Comunità Europea (eccetto l'Italia) usando le lettere dell'alfabeto come guida. P come Paella (Spagna) è ospitata da Francesca di Burro e zucchero. Su questa pagina trovate la ricetta della Paella e la lista dei contributi all'evento. Questo post è anche il mio contributo all'edizione numero 414 di Weekend Herb Blogging, un evento creato da Kalyn di Kalyn's Kitchen, organizzato ora da Haalo di Cook (almost) Anything at Least Once e la cui versione italiana è organizzata da Brii di briggishome, e ospitata questa settimana da Haalo.